We at Bubblin are fully stoked out to team up with RBMA to close 2013 with the hugely talented Machinedrum and a stellar local cast of support. His Vapor City Live A/V show, featuring Machinedrum on vocals, guitar, and electronics alongside a truly gifted live drummer, all set to beautiful visuals, has been garnering remarkable amounts of acclaim. We were bummed to miss him at Decibel Festival as everyone we came across told us it was the set of the festival, and word is the show has only become exponentially more amazing and fluid since then. 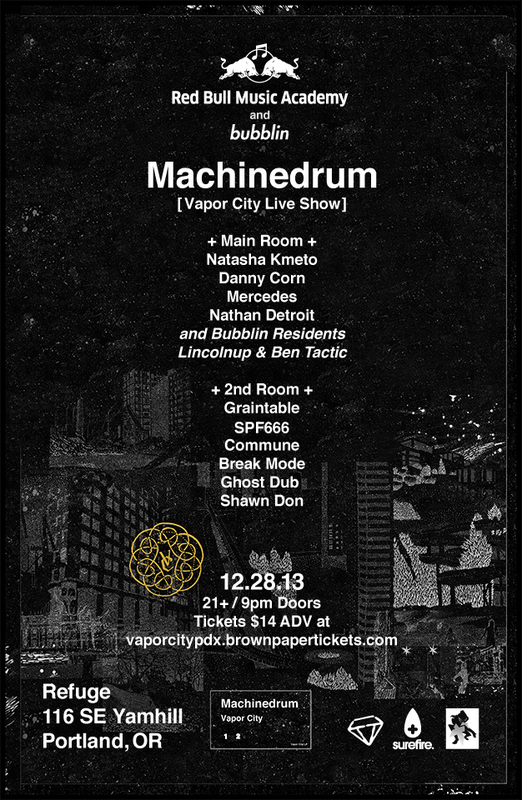 With support from PDX’s ascendant star Natasha Kmeto and further representatives of crucial PDX crews Dropping Gems, Booty Bassment, PDneXt, All Ours, and Club Chemtrail, plus Bubblin Residents Lincolnup and Ben Tactic, all over two rooms, with Video and Lighting by Tracer Visuals, this evening promises to be hugely satisfying. It’s been a pretty great 2013 and we’ve been very fortunate to see appearances at Bubblin from luminaries such as Falty DL, Todd Edwards, DJ Pierre, Ben UFO, Bok Bok, L-Vis 1990, Om Unit, and many more, and we are deeply thankful to everyone who’s supported our events this year. ♥ THANK YOU ♥ We won’t be doing a NYE party, in lieu of this, so please do join us here to close out this wild year in fine style! Born Travis Stewart on March 4th 1982, Machinedrum has produced and composed several albums under various aliases since his first independent release in 1999. Covering an astonishing variety of styles with ease, he has always been a trailblazer – bridging the gap between genres that would otherwise never have met before. Having a strong background in both acoustic and electronic instrumentation, he dances between those elements on all his releases. This can be heard inthe field recording and vintage synth laden Urban Biology to his seminal production and mixing of the This Charming Mixtape with MC Theophilus London and his critically acclaimed 2009 album Want To 1 2? 2010 saw Machinedum re-surface in a major way. His Many Faces EP on Glasgow-based label LuckyMe garnered attention from a brand new audience and opened the door for his very first performance at Sonar Festival. Simultaneously his newest side project Sepalcure, a duo with Praveen Sharma, became one of the intriguing names in the post-dubstep and UK funky scene. Two EPs, Love Pressure and Fleur, released on imprint Hotflush, has giventhe duo NYC ambassadorship for this UK-based genre. An additional EP release on Innovative Leisure and musical composition for the off-broadway musical Camp Wanatachi completed one of Machinedrum’s busiest years to date. In the past year, Machinedrum has relocated to Berlin and maintained a steady flow of releases including the celebrated Alarmaa EP on LuckyMe and his very first releases on Planet Mu Records the Sacred Frequency EP which served as a teaser for the critically-acclaimed Room(s) LP immediately followed by Ecstasy Boom, a free gift to fans offered on the web, and a self-titled LP from Sepalcure that anchored the duo as true tastemakers of electronica. SXLND, Stewart’s latest release with LuckyMe, is once again redefining his sound and keeping fans, along with critics, guessing what is still in store. Hard to believe, but the best is yet to come. A true electronic music Renaissance man, Machinedrum blends together current pop music standards and trends with his own extensive knowledge of experimental production techniques, delivering his quality signature on every thing he touches. Natasha Kmeto is a Portland-based singer and electronic producer who turns heads everywhere she goes. Armed with a taut dance floor sensibility and flutteringly sensuous voice, she exudes the kind of beauty that can only come from confidence. Her tracks are sleek and energetic affairs, straddling the line between dance, pop, and RnB, percussively intriguing compositions that slide easily into the ear but aren’t so easily forgotten. Her beauty, energy, and talent coalesce into a truly visceral live show, moving both to the partygoer and the thinking person alike. Wherever her music goes, heavy breathing will follow. Born into a musical family in California, Natasha began to develop her talents as an artist from a young age. It wasn’t until almost two decades later, on the verge of becoming a career session musician, that she grabbed the wheel and broke out in a direction that truly inspired her. Her arrival in Portland marked a big step towards new things. The past several years as seen her growth quicken, especially after signing with hometown label Dropping Gems. The string of releases that have followed showcase Natasha in her most self-realized form, in matters of love, independence, and outlook on life. Natasha has a long list of notable live performances under her belt, including gigs at Coachella, Bumbershoot, MusicFestNW, Symbiosis, SXSW, Low End Theory (LA and SF) and Decibel Festival. She has shared the stage with a number of talented artists as well, including Squarepusher, Emancipator, Kid Cudi, Plaid, Gold Panda, Dam Funk, Shlohmo, Shigeto, and Morcheeba, just to name a few. Her radio experience includes live performances on Boiler Room and KEXP, and her tracks have been played by numerous noteworthy DJs including Mary Anne Hobbes. She is due to release her LP ‘Crisis’ June 18th on Dropping Gems. This entry was posted on December 5, 2013 at 10:58 am and is filed under Ben Tactic, Break Mode, Bubblin, Club Chemtrails, Commune, Danny Corn, Ghost Dub, Graintable, Lincolnup, Machinedrum, Mercedes, Natasha Kmeto, Nathan Detroit, Ninja Tune, Red Bull Music Academy, Refuge PDX, Shawn Don, SPF666, Tracer Visuals. You can follow any responses to this entry through the RSS 2.0 feed. You can leave a response, or trackback from your own site.